Homeowners love growing poplar trees (Populus spp.) because these American natives shoot up fast, bringing shade and beauty into backyards. There are some 35 species of poplar and, since they cross-pollinate, an infinite number of hybrids. 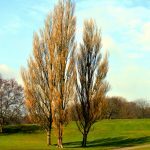 Are poplar trees good or bad as shade trees? 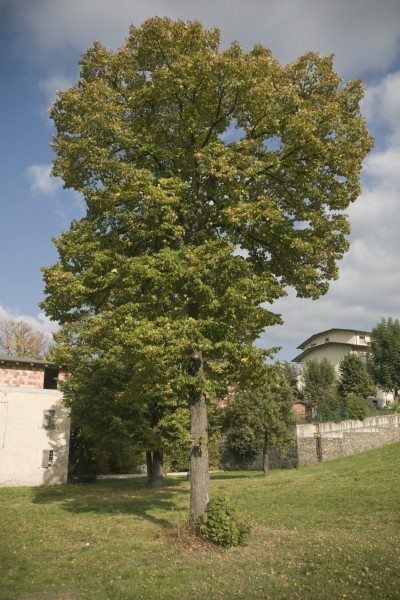 Read on to learn the factors that you must consider before growing poplar trees. Poplars can grow very tall and anchor their trunks with powerful roots. These roots might cause problems for homeowners or gardeners who are not familiar with basic poplar tree facts. For instance, planting hybrid poplar trees near houses is not recommended. Poplar trees thrive in warm weather and moist to wet soil. They grow most prolifically in the southern states where these conditions are met. Although poplar varieties range in height and breadth, most share some traits that make them easy to recognize. For example, you can often distinguish a poplar by its leaves that are often heart-shaped and rimmed with tiny teeth. Brilliant green in summer, they glow gold in autumn. Every poplar tree bears both male and female flowers, and in springtime, before the leaves open, you can see hanging clusters of yellow blossoms. 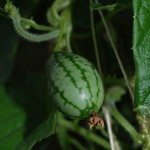 The fruits also appear before the poplars leaf. They are small capsules that contain the seeds. You are most likely to see four poplar varieties in the United States: white, eastern, Lombardy, and balsam poplar. The first two are massive trees, growing to over 100 feet tall. Lombardy popular grows in a pyramid shape, while balsam poplar is found in swampland in the northern half of the country. 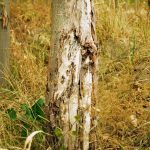 Whether you are planting hybrid poplar trees or one of the popular varieties, you’ll find that poplar tree care is easy in the proper location. Poplars need fertile soil, acidic or neutral, as well as direct sun and sufficient water to keep their roots moist. One of the most important poplar tree facts is the sheer size of the tree. It rises to between 50 and 165 feet high with a trunk diameter of up to 8 feet. You must be sure that your tree will have sufficient room to grow to its full size. Are Poplar Trees Good or Bad? Poplars are wonderful backyard trees, good for specimen planting as well as wind-rows. However, like every species, they have disadvantages. If you’ve heard stories about poplar roots crumbling house foundations, you already know a major issue with poplars. To hold up those huge trunks, poplars have powerful roots that can raise a sidewalk or disrupt a sewer line. Keep this in mind when selecting a planting location. The other downside of poplars is that they don’t live long. Even with the best poplar tree care, specimens die in about 50 years and you’ll have to plant again.